5. 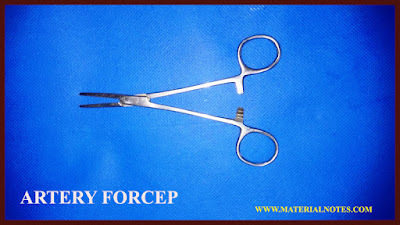 Non-toothed type may be Spencer Wells' or Halstead's artery forceps. 4. The inner surface of the blades are serrated and on locking the blades are well in appositon. 2. use as a clamp for the pedicles of internal organs like kidney, spleen, ligaments of uterus, etc. 4. To substitute in the absence of sinus forceps to enlarge the opening of an abscess. 7. To hold the incised edges of skin, fascia, etc. but rarely used due to crushing of tissues. 10. To hold the free end of threat or catgut during anastomosis of intestines. 12. Used for blunt dissection by holding peanut or swabs.